Your dashboard is a complex piece of machinery. 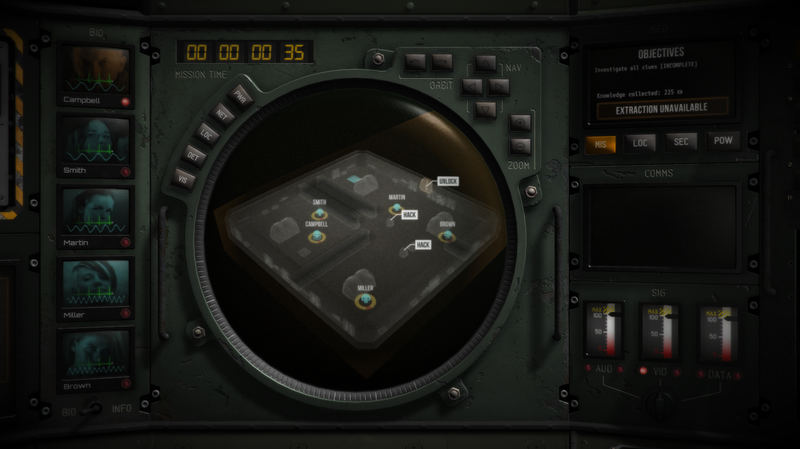 It allows you to scan a ship from a distance, track your Deadnauts, expose threats and issue orders. But it's not perfect. The information you see can be distorted by external security systems - called Watchers - that lock onto your Deadnauts and attempt to block the signals. If you don't take measures to block the Watchers, then your dashboard can turn against you, hindering orders, corrupting data and blocking your view. The main console contains the viewport, Deadnaut profiles, MFD, comms and signals. This visually represents what's happening on the other ship. Your Deadnauts will reveal rooms and furniture as they encounter them. They will also reveal threats, provided the Deadnauts can detect them. The buttons on the upper left of the viewport can show or hide information. NET: The onboard security system. All rooms are connected to a single network grid. Watchers can be seen roaming the grid. LOC: Reveal extra details about the location, such as room names and how damaged each room is. DET: Shows how much power is being pumped into the lighting in each partition. 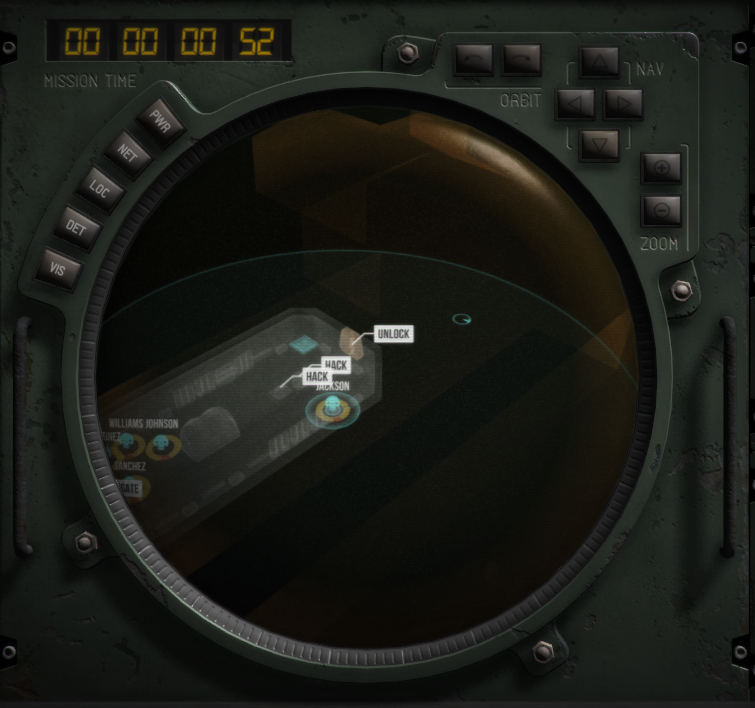 VIS: Hide the fog-of-war and highlight interactable objects. NAV: Pan the camera in cardinal directions. By default, you can use WASD to pan the camera; scrollwheel up and down to zoom; and Z/X to rotate. Deadnauts are controlled exclusively through the Viewport. To issue an order, you must select one or more Deadnauts. Left-click a Deadnaut in the Viewport or left-click their portrait. Select one or more Deadnauts and right-click on a free spot. Deadnauts will try and find the shortest path. Select a Deadnaut and right-click on an enemy or Sentinel. Your Deadnaut will attack with their best and safest weapon. Typically, this will be the primary weapon or a side-arm weapon. However, if the Deadnaut has a primary weapon that does explosive damage, then they will attack with their side-arm pistol if available. You can also hold down Control and left-click to use these abilities. Letting go of Control before clicking will cancel the action. 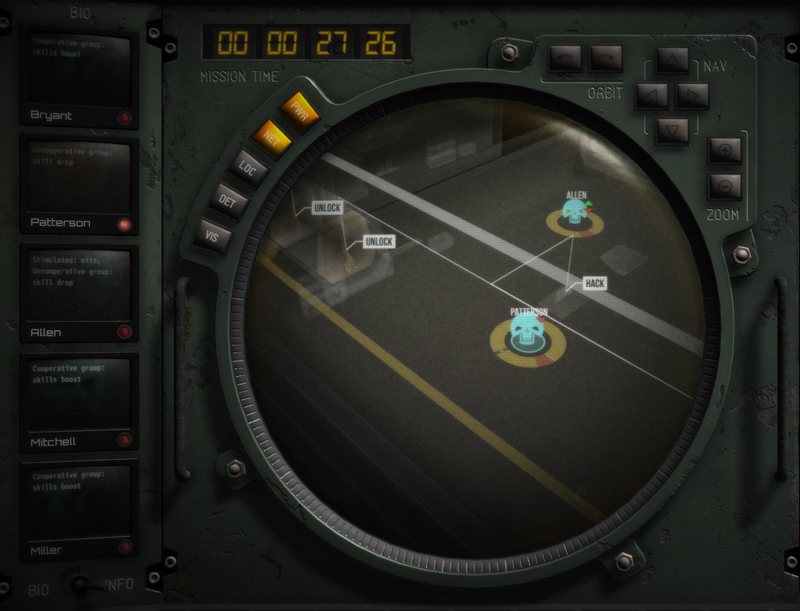 To interact with doors and other objects, select a Deadnaut and then click the corresponding tag in the Viewport. If multiple Deadnauts are selected, then the most skilled Deadnaut for the task will be the one to perform the action. The portraits show your Deadnauts. Clicking a portrait will open a communication channel, which lets you issue orders. When the channel is open, the red light will glow. When the Deadnaut is speaking, the red light will flash. You can see what they're saying in the chat log. The green heartrate monitor represents each Deadnaut's current health. It will gradually change colour to red and increase in speed as a Deadnaut becomes injured. The blue wavelength represents a Deadnaut's relative stability. The more erratic it is, the less stable they are. Portraits also have a secondary mode. Right-click on a portrait to show what bonuses or penalties are being applied, or flip the switch at the bottom of the portraits. The MFD, or multifunction display, gives you a quick snapshot of your progress and the location. MIS: The name of the mission and the current objective. LOC: The class of ship and its overall structural integrity. SEC: How the security system is allocating its resources. PWR: The distribution of the ship's dwindling power reserves to various subsystems. 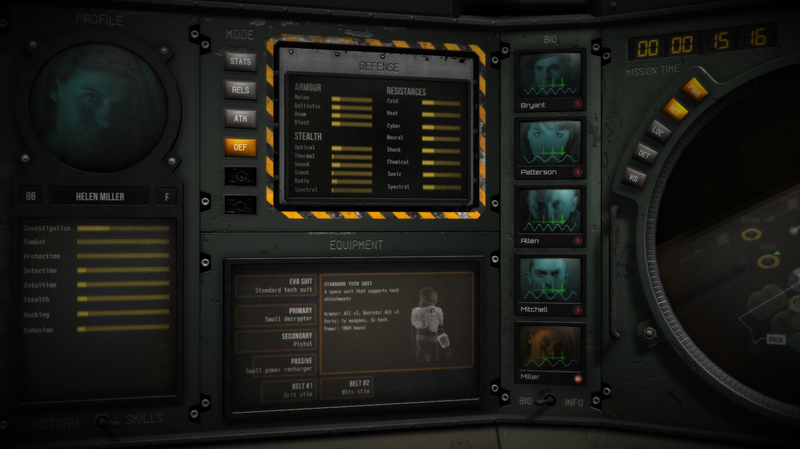 The Comms panel stores a log of all Deadnaut chatter. You can also find a full transcript on the Library console in the Campaign section. Your ability to command the Deadnauts is influenced by the signal strength. If there are no Watchers or disruptions to the signal, the strength will be high and you won't have anything to worry about. But if the signals degrade, you'll struggle to stay in control. AUD: Audio relates to issuing commands and receiving chatter. A poor audio signal might result in Deadnauts not receiving an order. Any chatter may also be garbled. VID: The main viewport becomes distorted, making it difficult to see what's happening or interact with the location. DATA: All screens excluding the viewport and Comms screen will distort. Your signals will slowly improve if there are no active Watchers. 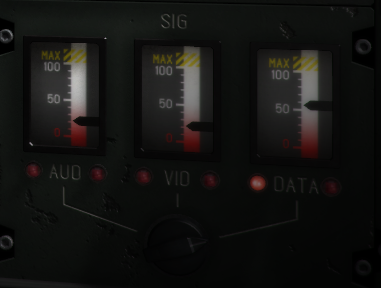 You can also boost a signal by rotating the dial to the associated signal gauge. The crew console gives you detailed information about your Deadnauts and their relationships, backgrounds, strengths and weaknesses. At any time you can select a portrait to focus the crew console on a Deadnaut. The photo, name, age and gender of the selected Deadnaut. SKILLS: A list of the Deadnaut's skills, flaws and any active effects. HISTORY: A brief timeline of the Deadnaut's history before joining the crew. Select a panel by clicking the buttons on the left. RELS: A breakdown of the crew's relationships, from yellow (negative) to positive (blue). ATK: Overview of the Deadnaut's offensive potential (using the strongest primary weapon or sidearm) and detection powers. DEF: The Deadnaut's passive armour, resistances and stealth profile. View currently equipped items here. If you haven't deployed your Deadnauts, you can also add or change their equipment. To add an item, first select the slot - suit, primary, secondary, passive or belt. If there's already an existing item, right-click the slot to remove it, or click the small 'X' in the slot's top-left corner. You can then select an item from Available Schematics. You can only equip an item if your suit has enough attachment ports available for that item. The library console lets you explore the information you've collected, as well as purchase schematics for new items and clone deceased Deadnauts. CAMPAIGN: Information about the current or previous missions. Includes a transcript of Deadnaut chatter. Select waypoints to change your view to a different mission. SHIPS: Details about the locations your Deadnauts have visited. Select the ship's title to view another location. THREATS: A snapshot of the threats your Deadnauts have encountered. Click the species name to access a different threat. 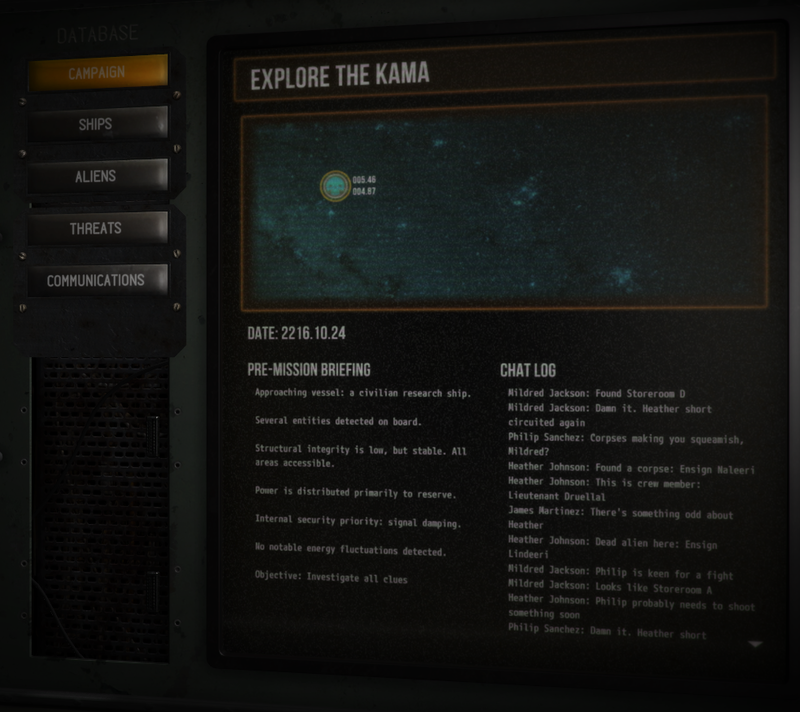 COMMUNICATIONS: Between each mission, you can contact Earth and trade the knowledge you've gained for new equipment. Select Category to inspect other items, left-click to order one (right-click to cancel), and then Transmit Order to complete the transaction. To clone a deceased Deadnaut, click Cloning, select the Deadnaut, and Clone.